When we started this project, we knew reader response would be a key. After last week’s first installment of the all-time high school top 10 by position, we asked for your input. And you came through like champs. I had a spirited exchange of emails with Jerry Powell. The 1967 San Diego Section Player of the Year, Powell led Lincoln High to a section championship, earning all-state and All-America honors along the way. Those are tremendous credentials. For better or worse, we set the criteria as “body of work,” counting high school and post-high school accomplishments equally. Powell didn’t play beyond high school. His argument is that if we’re choosing an all-time high school top 10, the criteria should be what a player accomplished in high school. No question, had the criteria been based just on high school accomplishments, Jerry Powell would have been at the top of the list. Finally, we agreed to disagree. I heard from Cliff Bryan in Carlsbad, who played against both Wayne Sevier and Ezell Singleton and thought we should have chosen Singleton as the best drop-back quarterback before 1960. Pleased to say Singleton was chosen as the best multi-dimensional QB before 1960. Bryan’s email showed we got those two players right. George Mitrovich, one of the movers and shakers in San Diego County, asked why we didn’t have Mark Malone on our drop-back QB list. Malone was a three-sport star in high school, so we shifted him to this week’s multi-dimensional list. Bob Johnston also questioned why Malone was left off. Johnston also asked why Dennis Shaw was left off, then corrected himself. Shaw was a star at San Diego State, but played high school football at Pomona Catholic. Patti O’Leary checked in, saying Don Norcross, the QB who took Kearny to the 1973 section title, shouldn’t be forgotten. Norcross was a good QB on a great team. He helped us put these lists together and said he didn’t belong. O’Leary also said we shouldn’t forget Wally Henry, Willie Buchanon, Ed Imo, Darnay Scott, Dokie Williams, Darren Carrington and Anthony Johnson. Most of those players were already on our lists. We’ll check out the ones who aren’t. Shon King was an OK receiver at Patrick Henry, but blossomed at San Diego Mesa and Wayne State before playing in the Arena League. He wanted to make sure he wasn’t forgotten. I appreciate his input and invite others who think they might be overlooked to check in. While I can’t say King will make the receivers list, I guarantee he has put himself on our radar. Next week’s list will be defensive linemen, followed by offensive linemen, then tight ends. Please let us know what you think and email me your thoughts. Damon Allen, Lincoln: A 1980 high school graduate, Lincoln was 22-2 in his two years as a starter. Allen went on to play at Cal State Fullerton ... when the Titans had a program. He led the football team to a pair of conference championships and threw only 3 interceptions in 300 pass attempts. Plus, he played on a Cal State Fullerton baseball team that won the College World Series and was a seventh-round pick of the Detroit Tigers in 1984. Spurned by the NFL, he played for Edmonton, Ottawa, Hamilton, the BC Lions and Toronto in the CFL. Allen was the quarterback on four Grey Cup championship teams, completed 5,158 of 9,138 passes for 72,381 yards and 394 TDs. Plus, he rushed for 11,920 yards. He was inducted into the CFL Hall of Fame in 2007. Sal Aunese, Vista: The 1985 CIF Player of the Year, Aunese led Vista to a 13-0 season and a mythical national championship as a senior. Recruited by all the big-time college powers, he chose to play for then down-trodden Colorado. After sitting out the '86 season, he was named the Big 8 Newcomer of the Year in 1987 with the team finishing 7-4. In 1988, he led the Buffaloes and 8-3 finish and a berth in the Freedom Bowl in Anaheim against BYU. Tragically, he was diagnosed with an inoperable form of stomach cancer shortly after that game and died at age 21. A limited-theater run of the documentary film "Born to Lead: The Sal Aunese Story" is set for late fall. Billy Bolden, Kearny: The 1964 CIF Player of the Year, Bolden went on to play at UCLA. In three seasons for the Bruins, he passed for 624 yards and 5 TDs and rushed 132 times for 521 yards. Anthony Lawrence, Grossmont: An all-state player as a senior in 2013, Lawrence threw for 9,079 yards (No. 1 all-time in San Diego at the time), rushed for 750 yards, had 9,829 yards total offense, competed 691 passes and threw for 96 TDs in his prep career. Plus, he was a four-year starter on the basketball team. His college career isn't complete, but he has had two big-time seasons at USD, going 434 for 659 with 5,390 yards and 48 TDs. Teddy Lawrence, Morse: The 1990 CIF Player of the Year, was a do-everything player for the Tigers, leading Morse to an unbeaten season and a 28-13 win over Orange Glen in the 3A championship game. Lawrence had a 99-yard kickoff return in that game. He averaged 13.79 yards rushing on 101 carries as a senior. Lawrence went on to play at UCLA where he played 46 games in the defensive secondary. He had seven career interceptions, returning one for a TD in 1993 to beat Washington. Mark Malone, El Cajon Valley: A 1975 graduate of El Cajon Valley High, Malone was a three-sport star in high school. In addition to football, he was a standout basketball player and was among the best in the county in the shot put and discus. He went on to play football at Arizona State, throwing for 4,388 yards and rushing for 1,344 and 21 TDs in three seasons. A first-round draft pick of the Pittsburgh Steelers, he played for Steelers, Chargers and Jets, throwing for 10,175 career yards and 60 TDs and rushing for 628 and 18 TDs in a 10-year career. He led the Steelers to the 1984 AFC Championship game. Abraham Muheize, El Cajon Valley: After a magical 2005 senior season in which he led the Braves to the CIF championship game, Muheize was named the CIF Player of the Year, throwing for 4,047 yards and 41 TDs and rushing for 1,150 yards. On defense, he had 118 tackles and 10 interceptions. He spent two years at Grossmont College where he was all-conference as a defender. Muheize finished his playing career at Eastern Washington where he played defensive back and linebacker. 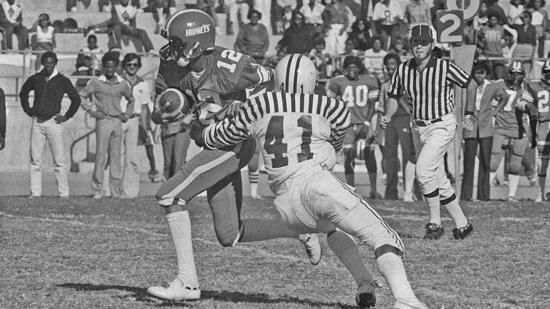 Joe Paopao, Oceanside: A standout quarterback, linebacker and punter in high school, Paopao graduated in 1973 and went on to play a Long Beach State. In two seasons as a starter, he threw for 2,830 yards. leading the 49ers to a 17-5 record. Known as the "Throwin' Samoan", Paopao played 11 years in the CFL with the BC Lions, Saskatchewan and Ottawa, throwing for 22,474 yards and rushing for 353. He went on to a long coaching career in the CFL as a head coach and an assistant. He returned to Oceanside this season and is an assistant on coach Dave Rodriguez's football staff. Paopao was inducted into the Long Beach State Hall of Fame as well as the City of Oceanside HOF and the Oceanside High HOF. Dave Roberts, Rancho Buena Vista: Bouncing back from a broken leg suffered during his junior year, Roberts was the engineer of the 1989 Longhorns team that featured a pair of 2,000-yard rushers .... Markeith Ross and O.J. Hall. Recruited by the likes of Air Force and Oklahoma as an option QB, Roberts chose to play baseball at UCLA. In four seasons with the Bruins, he left as the university's all-time stolen-base leader. A 28th-round draft pick of the Detroit Tigers in 1994, Roberts played 10 years in the big leagues. In 832 games, he hit .266 and had 243 stolen bases, including one in the 2004 ALCS against the New York Yankees that propelled the Boston Red Sox to a World Series championship. He was named manager of the Los Angeles Dodgers in 2016 and was the National League Manager of the Year. Jeff Van Raaphorst, Grossmont: A standout run-and-shoot quarterback at Grossmont in 1983, Van Raaphorst went on to play at Arizona State. He played 30 games for the Sun Devils, throwing for 6,443 yards, leading the team in passing three years in a row. He was the MVP of the 1987 Rose Bowl, leading Arizona State to a 22-15 win over Michigan. ASU finished 10-1-1 that season. Van Raaphorst played two games in the NFL for the Atlanta Falcons in 1987. He was inducted into the Rose Bowl Hall of Fame in 2006. Ezell Singleton, San Diego: A three-sport star - football, basketball and baseball - at San Diego High, Singleton graduated in 1959. He went on to play at UCLA when the Bruins were employing a single-wing offense. In three seasons at UCLA, he rushed 153 times for 338 yards and completed 20 off 44 passes for 219 yards. He also played baseball for the Bruins. Singleton passed away in 2012.